In Windows, HyperSnap could help auto scroll the window and capture the whole web page. The Mac OS X build-in software Grab can not do this. After googling, I found out this software Paparazzi! really helps. Update on 2012/12/21: Now use chrome extension: Screen Capture(by Google) can do the trick with Chrome. 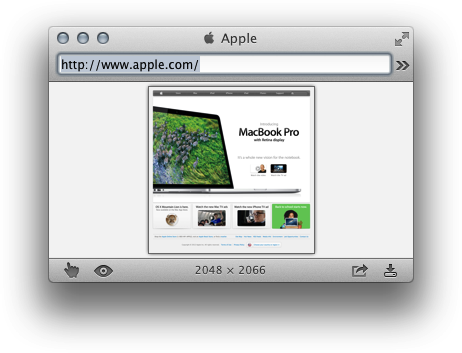 There are 7 responses to “Auto scroll and capture the whole web page in Mac OS X”. Thanks for sharing this tidbit. I’ve been looking for a Mac-based scrolling screen capture application for a long time but I must have been searching in the wrong places. This simple application works like a charm. This doesn’t work on protected pages. @Marcel Touma: And not working for some browser plugins. I could not capture flash once.. Try Layers by Wuonm its a wonderful little program but it is not a free program. @Ray: Thanks! It’s really awesome! Layers is quite nice. Bought it within five minutes of seeing its functionality. Its perfect for my needs, especially because it grabs a scrolling browser screenshot from within the A-class browsers, not within its own browser.